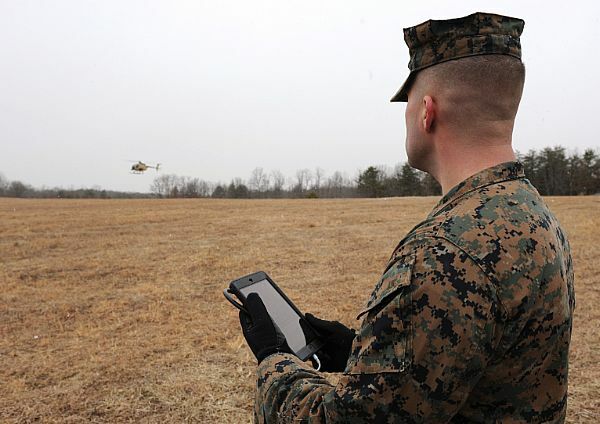 MARINE CORPS BASE QUANTICO, Va. – The Marines showed off a high-tech system that could deliver life-saving supplies by air to troops operating in rugged terrain in a future conflict, without risking the lives of an aircrew. During the demonstration, an old UH-1H Huey helicopter flew three missions to deliver cargo to Marines at a remote landing zone and a simulated forward operating base, without a pilot on the controls and with two enlisted Marine infantrymen providing minimal instructions from a small hand-held tablet and a laptop. The technology that enabled the missions is called the Autonomous Aerial Cargo/Utility System (AACUS) and was described as a major leap ahead of current unmanned aerial systems. It was developed by Aurora Flight Sciences in partnership with the Office of Naval Research, in response to an “urgent needs statement” from operational Marine forces and will be further tested by the Marines in the next phase of their Sea Dragon experiments. “This is more than just an unmanned helicopter. 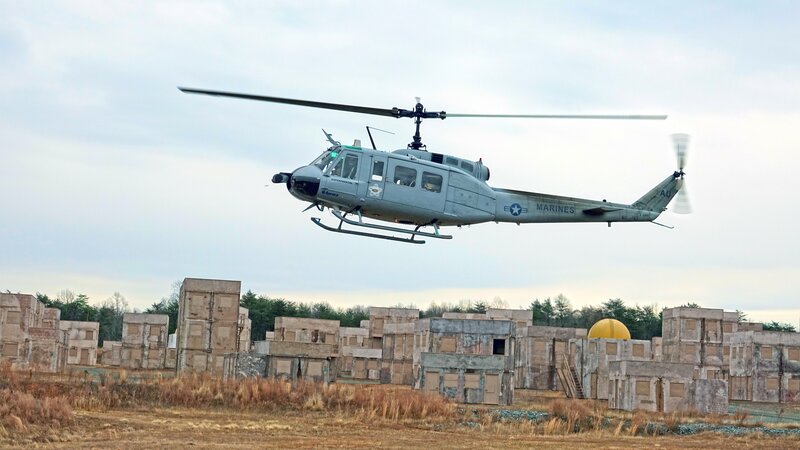 AACUS is an autonomy kit that can be placed on any rotary-wing platform and provide it with an autonomous capability,” said Walter Jones, ONR executive director. Unlike standard UAS operations, in which a trained ground operator provides detailed flight directions to the aircraft, the AACUS system in the Huey only received destination information and liftoff permission from the two Marines. The system then did the mission planning itself, charting the optimal route to the destination, avoiding obstacles and no-fly areas and picking the best landing spot near the troops it was supporting. The mission system draws its information from an array of sensors – optical cameras and LIDAR devices – all of which were commercial off-the-shelf components package and empowered by software and algorithms developed by Aurora and its partners. The two Marines who initiated the missions, Sgt. Dionte Jones and Cpl. Christopher Osterhaus, were infantrymen with no previous training in autonomous systems. They said it took mere hours of instruction by Aurora technicians for them to learn what was required. Lt. Gen. Robert Walsh, commanding general Marine Corps Combat Development Command, said the “great capability” in AACUS was developed ahead of a formal requirement of program of record. “It’s up to us to determine how to use it,” he said. But Walsh said a system like AACUS could enable the Marines to fight in the widely distributed conditions that are considered that could be necessary for survival in a conflict with a peer competitor. The technology also will help the Corps learn how to use man-unmanned teaming and machine learning, he said. Lt. Col. Dan Schmitt, of the Marine Corps Warfighting Laboratory, said the AACUS system will be tested further in the second phase of the Sea Dragon experiments, which will focus on logistical support in a distributed environment. Those tests would begin in April at Marine Corps Combat Development Center, Twentynine Palms, Calif., he said. The Marines have been seeking an unmanned cargo delivery system for more than a decade, and tested the K-MAX unmanned helicopter, which was a Kaman commercial chopper provided unmanned capability by Lockheed Martin, to deliver cargo to forward operating bases in Afghanistan for several years. It never became a program of record. Walsh noted that the AACUS capability was nothing like the standard UAS systems in K-MAX, which were operated by Lockheed technicians and deliver relatively small sling loads of supplies over short distances.